NSS Department of Desh Bhagat University organised a blood donation camp in association with Lions Club, Mandi Gobindgarh, in which members of the staff, students of different faculties, volunteers, officials and members of Lions Club donated 58 units of blood. Desh Bhagat University Pro Chancellor Tejinder Kaur was the Chief Guest on this occasion. While inaugurating the camp, she said that donating blood means saving precious lives and the students should come forward in large numbers for this service of mankind. Chancellor Dr. Zora Singh appreciated the NSS department and Lions Club’s blood donation drive initiative. In his message, he expressed that students should set an example for others by becoming regular blood donors and donating maximum units of blood. Speaking on the occasion, university Vice-Chancellor Dr. Shalini Gupta said that blood donation is one of the best services of humanity. 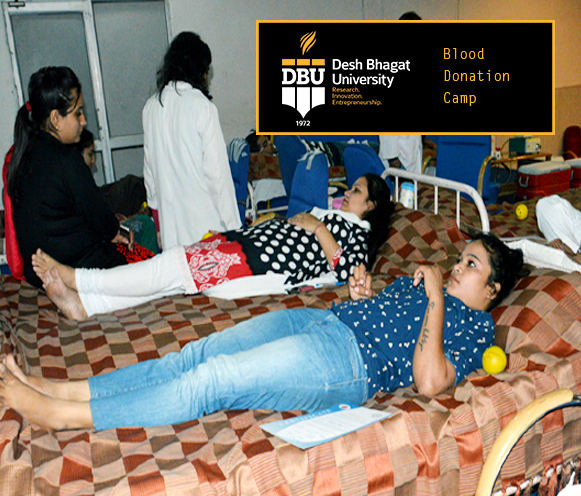 Desh Bhagat University has been organising such blood donation camps on regular basis and students remain ever ready to contribute to this noble cause. The camp was highly successful and the enthusiasm shown by the young students and volunteers of NSS and Lions Club was exemplary. Mr. Shashi Kant Pandey and his wife Mrs. Poonam Pandey celebrated their marriage anniversary by donating blood. Lions Club President Mr. Hemant Gupta, Secretary Rajesh Bassi, Treasurer I.P.S Kochhar, Project Chairman Anit Mittal and other members of the club honoured Mr. Sanjay Dhiman who donated Blood for the 41st time. The medical team was led by Dr. Swati from Govt. Medical College and Hospital, Chandigarh along with 10 members. The Blood Collection team distributed certificates, refreshment and badges to the blood donors. Besides the faculty and the students, Registrar Dr. Varinder Singh and Director Dr. Kulbhushan were also present on this occasion. All the dignitaries highly appreciated the students for their zeal and dedication.